Sweet Lassi, a yogurt based creamy, sweetened and chilled beverage from Punjabi cuisine is a popular drink in North India. It is usually served after the meal or in the afternoon during the hot summer days as a cooling beverage. Nowadays, many varieties of lassi like strawberry lassi, rose lassi, mango lassi, plain lassi, etc. are available but the two main types are – SWEET and SALTY. In this recipe, we are making the sweet lassi – first, the curd is whisked until smooth and then sugar is added for sweetness and cardamom to get the nice flavor. Finally, water or milk is added to dilute it a little bit as per the preference. Curd is the key ingredient in lassi and so the whole taste depends on it. 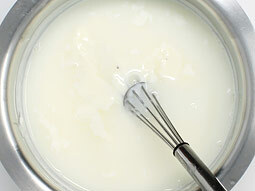 Use the homemade curd made from full fat milk, and make sure that it doesn’t taste sour to make the perfect lassi. Follow the below given recipe with step by step photos to make this delicious beverage at home and don’t forget to read the tips before making it. 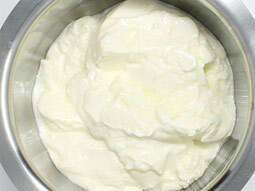 Take 2 cups curd (plain yogurt/dahi) in a deep vessel or a pot. We have used the homemade curd in this recipe. Add 3 tablespoons sugar and 1/4 teaspoon cardamom powder. 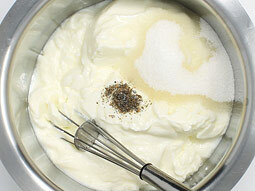 Whisk it using a hand beater or a wired whisk or a mathani or a hand blender until smooth. Add 1/2 cup water or milk. Whisk again for 1-2 minutes or until a nice frothy layer on top and sugar dissolves completely. Sweet Lassi is ready for serving. Pour into two individual serving glasses and garnish with chopped mixed nuts. Use homemade curd for better taste. 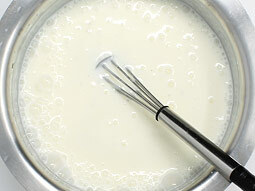 For the best flavor, use a mathani or a wired whisk (don’t use the electric one) to make the lassi. Make sure that curd is not sour otherwise the lassi will taste sour. 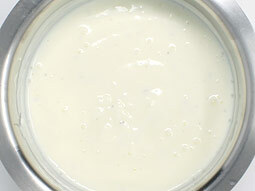 Use full fat curd (whole milk yogurt) for creamy lassi. Use powdered sugar to dissolve the sugar easily. For variation, top the lassi with a scoop of vanilla ice cream. 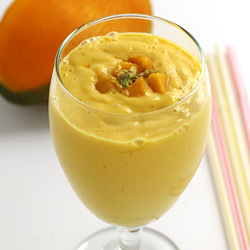 To make Fresh Fruit Lassi, add 1/2 cup puree of any fresh fruit like strawberry or mango. Serving Ideas: Serve lassi as a chilled afternoon beverage during hot summer days. 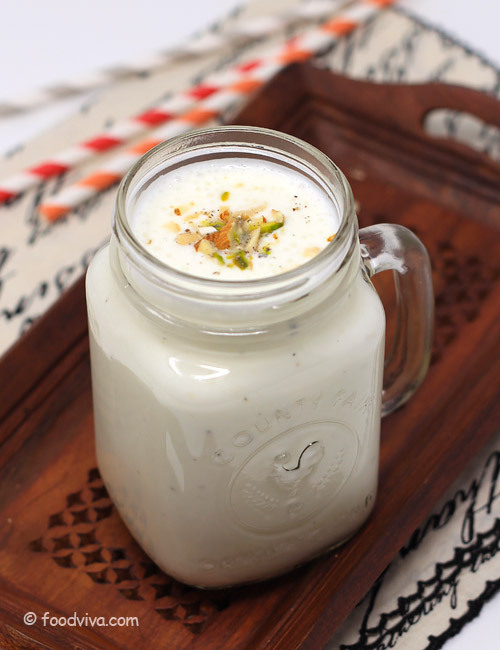 Top the lassi with a scoop of vanilla ice-cream and dry fruits to serve as a dessert in party.